The first drawing game that finally gives your little sister a chance to win! 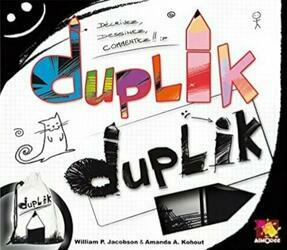 Duplik was awarded the Golden Ace - Game of the Year at the Cannes International Games Festival. One of the participants plays the role of the project manager. His mission: describe a funny illustration by giving the other players as much detail as possible. Meanwhile, his classmates drew the scene described. Once the hourglass has passed, the players exchange their works. The more criteria they include in their sketches mentioned on the illustration card, the more points they earn. Duplik understood you! To win, it is not necessary to know how to draw: it is enough that your work meets more criteria than those of your classmates, and you win! Contents of the box : 60 cards recto/verso representing unusual scenes, 1 score sheet, 1 red rodoid, 1 10-sided die, 1 hourglass, 1 rule booklet.